Provide optimal working conditions in a variety of settings while conserving energy. For lighting solutions that provide high performance, look no further. Cors Lighting, based in Jacksonville, Illinois, offers T5 LED high bays to suit your budget needs and outfit your workspace with the best possible lighting. Shop our inventory for LED lighting that will maintain bright lighting throughout its life. Enjoy up to 50,000 hours of light with our LED high bay fixtures using T5 lamps. Some of our most popular items and best sellers are available below! 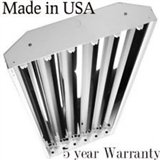 These are the ideal fixtures for warehouses, manufacturing facilities, gymnasiums, cafeterias, pole barns, machinery sheds and other commercial lighting applications where crisp lighting is required. 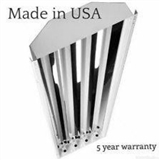 Buy T5 LED high bay light fixtures where very little maintenance is needed, and enjoy low operating costs, too! Call us at 217-806-0502 for a quote or consultation. Take advantage of our bulk discounts and FREE shipping on all orders over $99!